In 2014, the William Penn Foundation in Philadelphia launched the Delaware River Watershed Initiative, one of North America’s most ambitious projects to protect and restore an entire watershed. Fifteen million people rely on the watershed for drinking water. Its purity depends on the ecological health of the landscape – forests, farms, suburban and urban areas – and the rivers that flow through it. Since initiating the project, the foundation has recruited more than 50 nonprofits to participate, including land trusts, nature centers, academic institutions and advocacy groups. It’s a complex web of relationships designed to address a really complex problem. 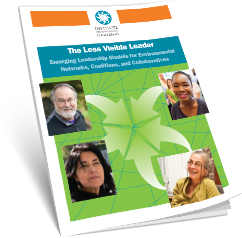 In order to manage all that complexity, they recruited a longtime partner, the Institute for Conservation Leadership, to help organize and facilitate the network. “We’ve catalyzed an enormous amount of activity,” said Peter Howell of Open Space Institute, one of the leadership groups in the network. “Collectively, we’re doing more and we’re moving faster than any group could have done individually. With the Delaware River project – essentially a big network comprised of smaller networks – we’re using every tool in our toolbox, including consulting, training, coaching, research, and meeting facilitation skills. Across Illinois, the landscape is threatened by a combination of development, pollution, and other pressures. A patchwork of protected lands – parks, forests, conserved areas – is set aside to preserve biodiversity, habitat, open space, and recreation opportunities. The key word is “patchwork.” Until recently, there’s been little effort to connect these fragments into a larger, more resilient network. Vital Lands Illinois was created by the Grand Victoria Foundation to both preserve threatened places and create opportunities to connect them into a larger conservation vision for the state. ICL was invited by the foundation to help plan, convene, and facilitate the Vital Lands Illinois network, which now includes a broad mix of nonprofits and government agencies. ICL’s involvement has yielded increasing synergy throughout the network, according DauBach. “Our individual leadership is stronger,” she says, “which means our organizations are stronger. We’re protecting more land. Because of the network, groups are coordinating their efforts to preserve larger blocks, which has a greater conservation impact. We’re working more effectively with state agencies. Maybe you’ve noticed those brown signs as you travel the interstate highway system telling you about entering a National Heritage Area or Corridor? These special places are where historic, cultural, and natural resources combine to form a nationally important landscape. Designated and supported by the National Park Service, National Heritage Areas depend on local groups for their programming, development resources, and public engagement. In 2017, ICL was invited to convene National Heritage Area groups in Yuma, Chicago, and Philadelphia to explore ways to proactively build partnerships, generate innovative ideas for engaging local communities, and become more resilient, connected, and sustainable for the work ahead. In coordination with others at the USDN, Matt Gray, Chief of Sustainability for the City of Cleveland, decided the time was right to bring together representatives from nearly two dozen cities to target sustainable economic development. Cynthia, Executive Director of the Gulf Restoration Network (GRN) in New Orleans, LA, is no stranger to crisis. When the BP oil spill hit the Gulf in 2010, Cynthia and her organization were ready for action. That was when a colleague from the Environmental Support Center recommended ICL’s Executive Director Leadership Program. “I learned what I needed to do as an Executive Director, and I learned that running an organization is like running a business,” says Cynthia. She followed the advice she got at ICL, and “because of that, Gulf Restoration Network is pretty effective.” Indeed, under her tenure, the organization has grown from 2 people to 14. She has relied on ICL not only for her own professional development, but she also sends her staff to ICL’s other leadership development programs. When Kate Fritz was hired to lead the South River Federation in Maryland, one of her first moves – at the urging of her board – was to enroll in ICL’s Executive Leadership Program. The program combined two multi-day training retreats with a lot of remote learning, coaching, and peer networking. Kirk Mantay is the organization’s Director of Watershed Restoration, the longest-serving employee, and a self-described “science nerd,” adding, “I’ve taken and taught most science classes.” But he’d never received training in leadership development. “I needed Kate to be successful,” he says – and increasingly, she was. As he observed the growth and change in her leadership skills, he decided to sign up for ICL’s Leading from Within, another long-term, intensive program. “It was an incredible variety of tasks that I didn’t understand,” recalls Tonya. Leadership training with ICL helped Tonya realize that organizations go through natural life cycles, and there are different tools to address the challenges at each stage. Previously, at the Center for Rural Affairs, Kim participated in a meeting convened by ICL to bring together a national group of crop, soil and agronomy scientists to meet with the sustainable agriculture community. The scientific associations had faced growing influence from corporate perspectives, with strong actors such as Monsanto and Cargill. Fast forward to Kim’s work today, and she is continuing her advocacy for alternatives to pesticides in the top leadership role at NCAP. Attending ICL’s Executive Director Leadership program was her board’s idea to ensure a smooth transition after the retirement of a 24-year long leader. Being able to reach out to other directors in the network, ask for advice, and gain insights from the ongoing coaching were invaluable to her in her first year at the helm. That year happened to be when the economic crisis hit in 2009. Her ICL coach helped her understand that the board would be looking to her for leadership. “ICL’s approach helped me strengthen my confidence and remember to trust my best instincts,” said Kim.